Lithium octa-n-butoxynaphthalocyanine (LiNc-BuO) is a promising probe for biological electron paramagnetic resonance (EPR) oximetry and is being developed for clinical use. However, clinical applicability of LiNc-BuO may be hindered by potential limitations associated with biocompatibility, biodegradation, and migration of individual crystals in tissue. To overcome these limitations, we have encapsulated LiNc-BuO crystals in polydimethyl siloxane (PDMS), an oxygen-permeable and bioinert polymer, to fabricate conveniently implantable and retrievable oxygen-sensing chips. Encapsulation was performed by a simple cast-molding process, giving appreciable control over size, shape, thickness and spin density of chips. The in vitro oxygen response of the chip was linear, reproducible, and not significantly different from that of unencapsulated crystals. 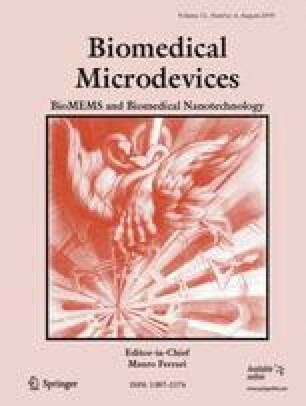 Cast-molding of the structurally-flexible PDMS enabled the fabrication of chips with tailored spin densities, and ensured non-exposure of embedded LiNc-BuO, mitigating potential biocompatibility/toxicological concerns. Our results establish PDMS-encapsulated LiNc-BuO as a promising candidate for further biological evaluation and potential clinical application. This study was supported by National Institutes of Health (NIH) grant EB004031. We would like to thank Daniel Iscru and Gunjan Agarwal at the AFM core lab, Ohio State University Medical Center for AFM data acquisition and roughness analysis.